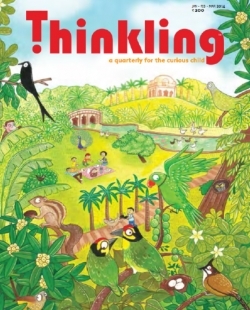 Find wonderful ways to enjoy the outdoors with Thinkling magazine for readers aged 7 – 12. Our debut issue has ideas for budding birdwatchers, eccentric scientists, aspiring writers, avid readers, intrepid explorers and sports fiends. Make your own bird feeder, write nonsense verse, tell a matchbox-sized story or hold an athletics meet. Publisher: Thinkling Publishers Pvt. Ltd.